NASA today received formal approval from the White House Office of Science and Technology Policy (OSTP) to proceed toward the launch of the robotic Cassini mission to explore Saturn and its moon Titan. "NASA and its interagency partners have done an extremely thorough job of evaluating and documenting the safety of the Cassini mission. I have carefully reviewed these assessments and have concluded that the important benefits of this scientific mission outweigh the potential risks," said OSTP Director Dr. John H. Gibbons, who signed the launch approval. NASA Administrator Daniel S. Goldin said, "I am confident in the safety of the Cassini mission, and I fully expect that it will return spectacular images and scientific data about Saturn, in the same safe and successful manner as the Voyager, Galileo and Ulysses missions." White House launch approval is required by presidential directive due to the type of power source used to provide electrical power for the Cassini spacecraft and its scientific instruments, and the heater units that it carries to keep the spacecraft's instruments and electronics warm in deep space. The radioisotope thermoelectric generators (RTGs) and radioisotope heater units used to power Cassini and keep its internal systems warm have been used in previous NASA missions ranging from Apollo to Galileo, and have been approved by five previous administrations ranging from Nixon to Bush. RTGs produce power by the heat generated through the natural radioactive decay of non-weapons-grade plutonium dioxide, which is transformed into electricity by solid-state thermoelectric converters. 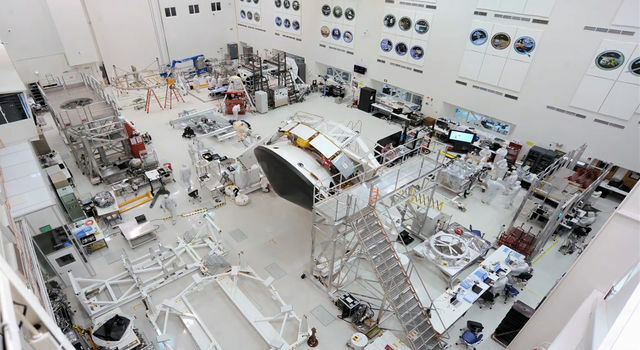 Before Administrator Goldin sent the request for launch approval to OSTP, two separate processes were completed to address the environmental and safety aspects of the mission. 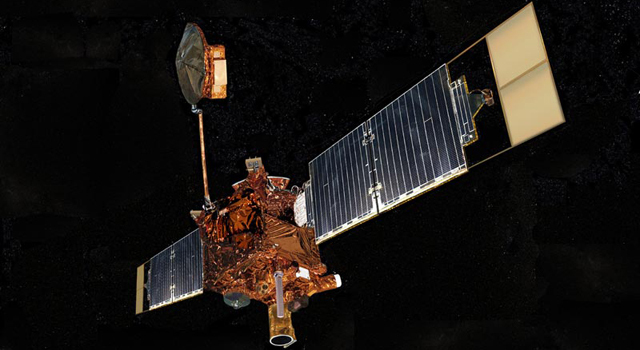 NASA completed an environmental impact statement in June 1995 and a supplement in June 1997, as required by the National Environmental Policy Act and NASA policy. Consistent with long-standing Presidential policy, the Department of Energy (DOE) prepared over the past seven years a comprehensive safety analysis report. In addition, an Interagency Nuclear Safety Review Panel, including safety experts from DOE, NASA, the Department of Defense (DOD), the Environmental Protection Agency (EPA) and a technical advisor from the Nuclear Regulatory Commission, conducted a comprehensive evaluation of the safety analysis. This panel was supported by more than 50 scientific experts from academia and industry. DOD, EPA and DOE have written to the NASA administrator confirming that, in their view, the safety analysis conducted for the mission is comprehensive and thorough. Cassini is a cooperative endeavor of NASA, the European Space Agency (ESA) and the Italian Space Agency, or Agenzia Spaziale Italiana. The mission will send a sophisticated robotic spacecraft, equipped with 12 scientific experiments, to orbit Saturn for a four-year period and study the Saturnian system in detail. The ESA-built Huygens probe that will parachute into Titan's thick atmosphere carries another six scientific instrument packages. Saturn is the second-largest planet in the solar system and is made up mostly of hydrogen and helium. Its placid-looking, butterscotch-colored face masks a windswept atmosphere where jet streams blow at 1,770 kilometers per hour (1,100 miles per hour) and swirling storms roil just beneath the cloud tops. Previous spacecraft passing by Saturn found a huge and complex magnetic environment, called a magnetosphere, where trapped protons and electrons interact with each other, the planet, rings and surfaces of many of the moons. Although it is believed to be too cold to support life, haze-covered Titan is thought to hold clues to how a primitive Earth evolved into a life-bearing planet. It has an Earth-like, nitrogen-based atmosphere and a surface that many scientists believe probably features chilled lakes of ethane and methane. 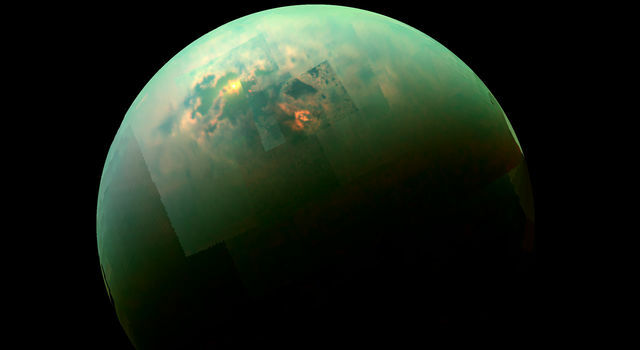 Scientists believe that Titan's surface is probably coated with the residue of a sticky brown organic rain. The launch of Cassini aboard a Titan IV-B/Centaur launch vehicle is scheduled for 4:55 a.m. EDT on October 13 from Cape Canaveral Air Station, FL. An on-time launch will deliver the Cassini mission to Saturn almost seven years later on July 1, 2004. Cassini's primary mission concludes in July 2008.